Provide comfort for the family of Dolores Leonard with a meaningful gesture of sympathy. Dolores Alice Leonard (nee Maradonna), of Springfield Township, NJ passed away on Tuesday, December 11, 2018. She was 83 years of age. Dee was born and raised in Riverside, NJ and had been a resident of Springfield Township for the past 42 years. 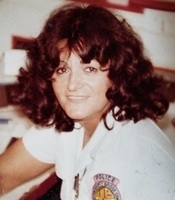 She was the first female toll collector for the Burlington County Bridge Commission, eventually retiring as a police dispatcher for the Police Commission. In her leisure time, she enjoyed music, dancing, and songwriting. She was loved spending time with her family – especially her grandkids – and she loved making people laugh. Dee was preceded in death by her sons, Robert Scott Leonard and Anthony Frank Leonard. Dee was a devoted wife and best friend for 56 years to her husband Tony Leonard; daughters, Cynthia McDonald (Donald) and Traci Leonard Kownacki (Edward); daughter-in-law, Stephanie Leonard; sister, Mary Butler; grandchildren, Michael Hensley, Deena Hacker (Jason), Anjelica Leonard, Ashley Leonard, Alexandra Leonard Cole (Michael), and Anthony Kownacki; and great-grandchildren, Madison Hensley, Mia Hensley, Jacob Hacker, Diminic Hacker, Liam Cole, and Nora Cole.